We understand our members value trees, as we do. Our members also rely on Flathead Electric Co-op to provide reliable power – in good weather and in bad. That’s why our tree care experts work to find a balance between reliable power and healthy trees. We are committed to working collaboratively with our members to address any concerns regarding trees in our service area. Use one of the links below to report a tree problem or to learn more about our tree maintenance program. 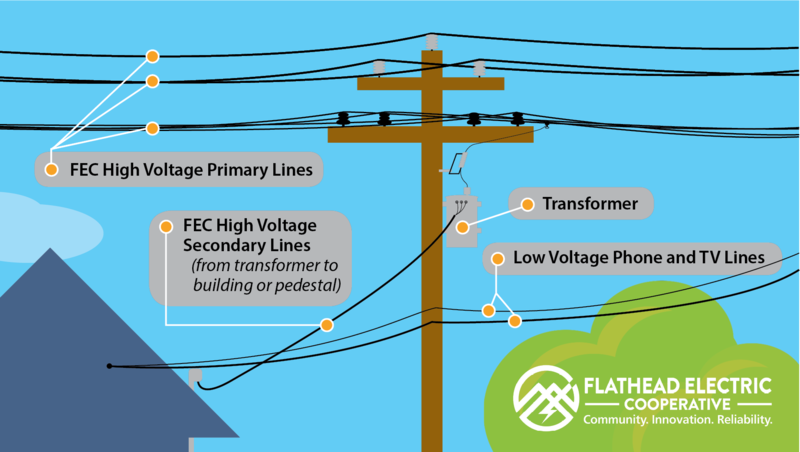 Is there a tree on your property growing into a power line; a dead or dying tree near a power line; a tree that has fallen into electrical equipment, but is not yet causing an outage; or a climbable tree near power lines that may present a future hazard? Report it here so our crews can investigate the situation. Please be detailed! The more information you can provide us on this form, the better we will be able to determine the best course of action. How far is the tree from the power lines? Which lines are being impacted by this tree? Are there hazards at the location? Would you like to be present during our visit? Please upload a photo(s) of the tree. It's very helpful if you can upload a photo of the tree and the line(s) being impacted so we can determine the best next steps. Do you have other comments about this tree maintenance request that might help us determine the best course of action? We are committed to providing safe, reliable energy, which includes trimming trees near our power lines. 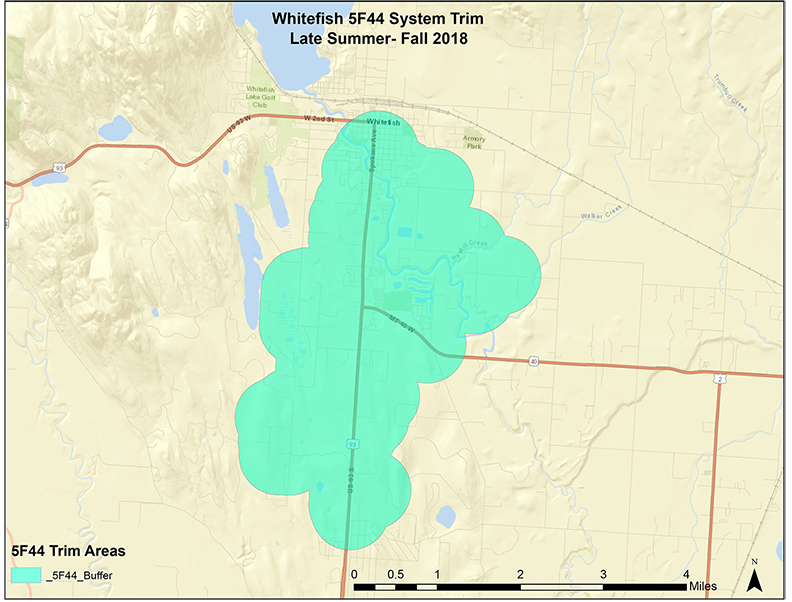 Flathead Electric’s Vegetation Management Program has important impacts. 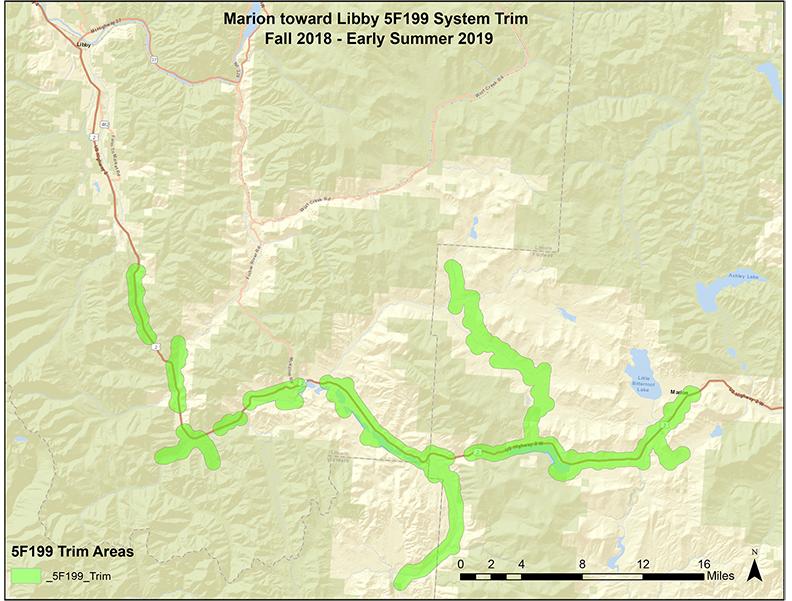 First, because trees are the cause the majority of our outages and second, trees are a very important part of the natural beauty of our valley. Trees interfering with electric utility lines or equipment are pruned or removed on a rotating schedule (our entire system is on approximately a ten-year cycle). To protect the 2,100 miles of overhead line, crews have a big job to do, trimming trees along 150 to 200 miles of line each year. This is in addition to responding to hundreds of tree trimming or removal requests from our members each year. Trees growing near and into power lines can create public safety hazards, start fires and cause power outages. FEC’s tree trimming program is an industry best practice designed to prevent dangerous situations and ensure electric reliability. We understand our members value trees as does FEC. These same members, however, also rely on FEC to provide reliable power – in good weather and in bad. That’s why our tree care experts work to find a balance between reliable power and healthy trees. We are committed to working collaboratively with you to address any concerns before tree work begins. When and where are upcoming system trims scheduled? 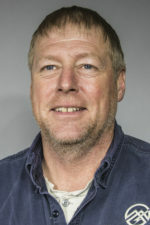 The following FAQs were developed by the Utility Arborist Association to provide an overview of how an electric utility uses tree maintenance techniques to achieve their goal to provide safe, reliable service. It’s a matter of safety and providing reliable power for the members we serve. RELIABILITY—Trees are among the most common causes of utility service interruptions. 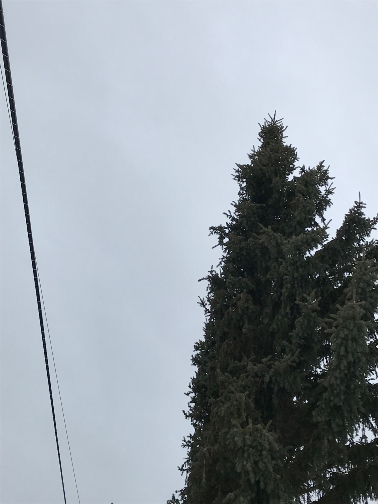 Trees that are too close to power lines can interfere with electric service; especially when weather brings lightning, wind, ice, or wet snow. My trees are not even touching the wires, why do they have to be pruned now? Utility companies are proactive and try to prune trees BEFORE they pose a risk to the power lines. 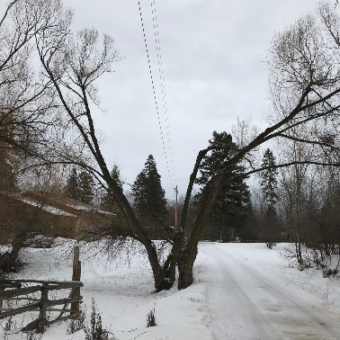 Because trees are dynamic, factors such as swaying in the wind, sagging with ice/snow weight, and uprooting in storms are examples of how problems can develop without warning even if the trees are not in contact with wires at this moment. Directional pruning removes branches growing toward the power lines while leaving those that are growing away. It is the most appropriate pruning method for utility line clearance. Trees growing directly under power lines may appear U or V-shaped (crown reduction or throughpruning). Trees growing alongside power lines may appear L- shaped, or one side may be completely removed (side pruning). 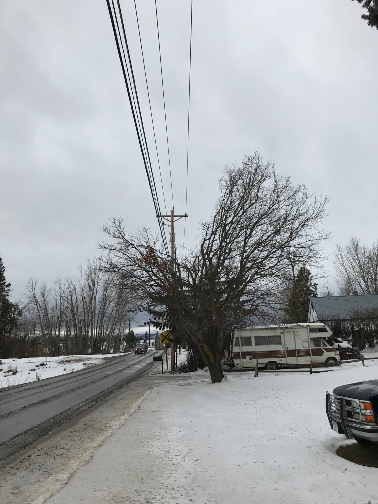 The tree may often appear misshapen but this pruning is being performed to provide for safety and service reliability, not for aesthetic purposes. In general, trees growing near the power lines will never have the potential to grow with a “natural” shape. DO NOT TOP TREES! Also called ‘roundingover,’ this is not directional pruning and is not an acceptable pruning practice. It involves cutting branches to stubs or lateral points that are not large enough to grow successfully. It can severely weaken the tree and even kill some species. Is my tree a candidate for removal? Who will be performing the work on my trees? Only qualified utility line clearance professional arborists who meet OSHA qualifications are legally permitted to work within 10 feet of power lines or work on a tree that has branches within 10 feet of power lines. Line clearance arborists are trained to prune trees according to American National Standards Institute (ANSI) A-300 pruning standards and follow industry best practices, which helps preserve the health of trees. DANGER: Homeowners should never hire a private tree contractor to work within 10 feet of power lines or attempt to do the work themselves. The utility should always be contacted for information first. What specific pruning guidelines are followed? The ANSI A-300 Part 1: Tree, Shrub and Other Woody Plant Maintenance—Standard Practices, Pruning are the accepted guidelines and are endorsed by the International Society of Arboriculture (ISA). 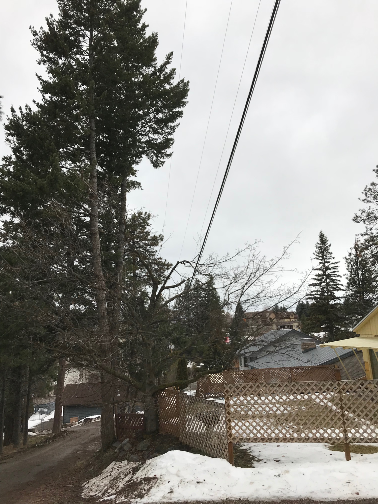 They promote directional pruning methods which minimize pruning stress and focus on tree health while obtaining necessary clearance from power lines. When it is time to trim, cut or plant your trees it may seem faster and easier to do it yourself rather than to contact a professional. Even if you are considering having professional arborists/landscapers perform your upkeep, it’s important to contact us and Montana 811 (UDIG) 755-UDIG for a free line locator before, just to be safe. 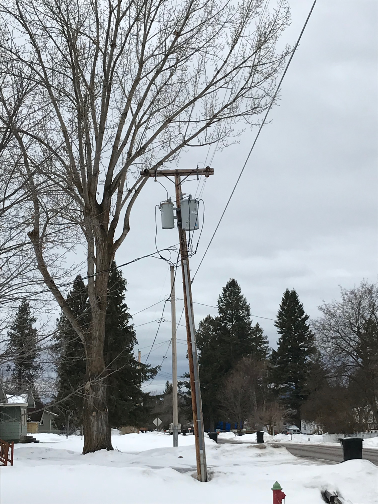 We encourage you to call the Co-op before you trim your trees so we can locate high voltage power lines and anticipate safety issues. If you have a tree or trees growing near or into our primary, high voltage power lines, we will trim or even cut the tree, free of charge to you. Trees that grow too close to power lines can be an extreme safety hazard for children and tree trimmers. To meet national safety codes, only line clearance certified tree trimmers are allowed to work on a tree within 10 feet of an energized, high-voltage line. Flathead Electric tree trimming crews, or contract trimming crews are trained in the latest pruning techniques as presented by the International Society of Arboriculture. 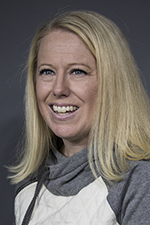 Please call Flathead Electric Right of Way at 406-751-5282 if you have questions. We understand that you take pride in homeownership and the maintenance of your land, but in the best interest of public safety and providing our workers with a safe working environment, following these instructions can mean the difference between life and death. Trees beautify our neighborhoods, and when planted in the right spot, can even help lower energy bills. But the wrong tree in the wrong place can be a hazard… especially to power lines. We ask that members avoid planting trees within 20 feet of power lines. When planting within 20 feet is unavoidable, plant and maintain only grass, flowers, or low-growing, trees, hedges or shrubs within the 20-foot zone, either side of the power lines. 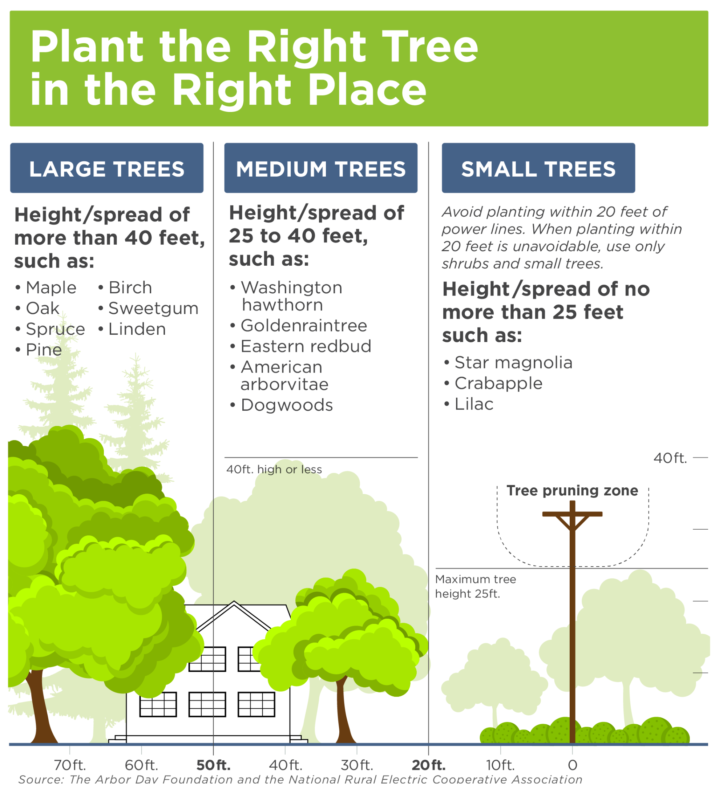 For your reference, Flathead Electric maintains a list of Small Trees – maturing at less than 25′ tall (PDF). Thank you for helping us continue to provide you with reliable, efficient service in the future! Our crews trim trees along 150 to 200 miles of line each year in addition to responding to hundreds of tree trimming or removal requests from our members. 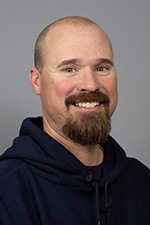 You may see one of our friendly arborist planners in your yard or neighborhood inspecting the power lines and trees to determine where trimming is needed. I really enjoy working with our members and try to be as fair and balanced as possible while still ensuring reliability for our 50,000 + members. I love, live, laugh, speak and work with my whole heart. I believe that I can make a difference in someone’s day and in my work by being positive and keeping my ‘glass half full’ mentality. I really apply this to my daily interactions with Co-op members. I care deeply about the people and listen to the concerns of our members. I try to make balanced decisions that serve the interest of all of our members and for future generations. I have always loved working with trees. It has been in my blood from a very young age. Maintaining Flathead Electric’s right-of-way is challenging, but very rewarding. I enjoy doing my part to ensure our members’ power reliability. 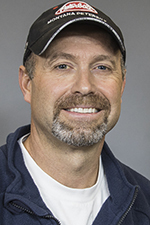 I am a Flathead valley native with 19 years at the coop in three different positions; meter reader, a Distribution Line Designer, and a Journeyman Tree Trimmer. I enjoy time spent with family and friends outdoors whether hiking, skiing, or spending time at the lake. I enjoy the new challenges the job presents everyday. Meeting members and providing safety for the public as well as protecting our system from future outages. As a member of the vegetation management crew, I look forward every day to help keep power reliable while also working with members. I also enjoy the day to day challenges of tree work and the opportunity to work outside. Flathead Electric tree maintenance crews periodically have wood chips available for delivery to members for mulching, landscaping and other purposes. Unlike clean white chips sometimes used in landscaping, these chips contain organic matter such as bark and pine needles. To receive wood chips, members need to have dump truck access (cleared of snow and with solid ground underneath) and have no overhead power lines that might conflict with raising a dump truck. The minimum delivery size is one load (approximately 15 cubic yards). To minimize haul costs and time, crews will deliver chips, as they become available, to areas nearest their current job site. To be added to Flathead Electric’s “chip list” for a future delivery, call 406-751-5282, or complete the form below.